You actually haven’t seen The Mask? I hereby bestows hitler’s shame on you! You’re obvious a Nazi with socialist inclinations! You’re not worthy to bear the name “human”. Lemme talk to better people jwo, as I was saying, the movie was awesome, aproximately 60 mins of hilarious shii……after all that tho’ a phrase jim carrey used in the movie stuck in my head. Those words were thought provoking peepz,buh my brain cells were on the fritz (blame it on too much tv) and I just couldn’t bring myself into beginning an exploration into the bottomless pit that is that 4 letter sentence so I decided to do a lil sampling, you know as e dey be na, forget ooh, I be correct scientist, I can define biology, physics and chemistry. Dem neva teach us maths own sha. So I got 3 of ma real gees to work on this with me, it gonna be a 2 post exposé, this being the first,containing thoughts from the world renowned @punstarr and the world famous @oVunderkind. The second is gonna be a story guaranteed to knock your socks off by the Blaqest Red Devil @itzEDK. Wanna know why I’ve refused to express an opinion on this? Cos my thoughts are just too twisted and explicit to be written! guaranteed to blow your phones,laptops or whatever weird device you may have opened this blog with. Nice guys dey carry last because they are in the GREEN zone. Please do not mistake this for an Eco-Friendly zone as this has nothing to do with bed warming or global warming. The Green zone is the “friend zone” or “Please help me pay my internet subscription zone”.They want something from the female but they’re too nice to tell her because, “She will think I’m rude”, but we all know that girls like the bad boys. She will prefer to go and worship the “bad boy” and complain to the “nice guy” about how bad she’s been treated. Niccuh @punstarr be right, then she go come meet me dey complain say all guys are the same! Wen me with my cool glasses and nerdy swag dey carry you go buy freshbite popcorn every evening? A wise man once said, “nice guys finish last” (I assume it was a man. I also assume it was a man who happened to be wise. Don’t question me, earthling!) Since then, those words have permeated through society, and we always know the nice guys finish last. But what do the words mean? Who, exactly is a “nice” guy? 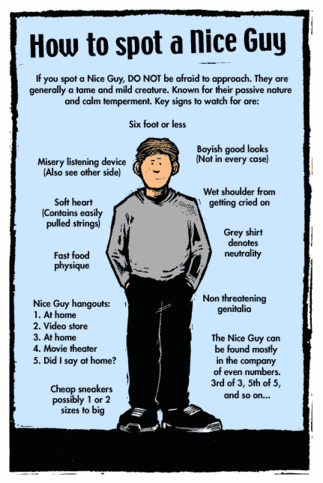 Is that overtly fair-skinned dude with the overlapping pimples and watery eyes framed by horn rims the “nice guy”? Let us take a walk down ancient history and read ancient wisdom from the Bro Code. A Nice Guy, by my definition (what did I say about you questioning my judgement?) Is one who is too considerate about the woman’s “feelings” (like they had any of that) that he dallies in making his opening move. The nice guy is the one that walks her the long distance home after class. He’s the one who helps her with her assignments when she’s lagging behind. Heck, the nice guy gives her his cardigan in night class while he reverts to “icicle” mode!!!! Nice guys don’t finish last because they are nice. Nah. Rather, they finish last because they suffer from a congenital defect. Medically, it’s referred to as “Acrophobia of the Scrotum”, a case where the testicles are so scared of heights, they never drop. and when your testicles never drop, you can’t exactly grab life by the balls. Basic learning, really. This is why they finish last. It’s a condition, and not something they should be embarrassed about. Heck, if there weren’t that many “nice guys”, Christ, how would we have gotten laid? P.S: watch out for the sequel for @itzEDK, maybe tomorrow, or the next, or the upper one,maybe next week sef…..just keep watching out sha! LOL! Put that way, in combo form, it’s some pretty hilarious shii….didn’t know we had this much hilarious peeps on here. I feel well and truly blessed! Obviously,being talented and mentally retarded ain’t mutually exclusive. 😀 nice post dudes!